Ground turkey is a healthy alternative to ground beef that tastes great! Check out this delicious ground turkey recipe for a family-favorite recipe! This isn’t your dad’s ground turkey recipe. 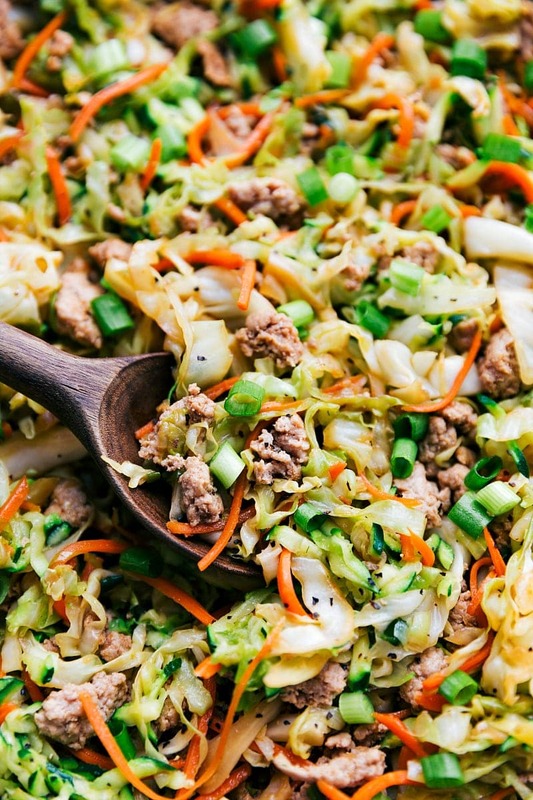 At it isn’t my dad’s ground turkey recipe…Growing up my dad made a dish similar to this one – tons of cabbage, zucchini, etc, but he always used ground beef. It was a much-loved dish in our house and we’d ask our dad to make it for us all the time. If you’re looking for a delicious ground turkey recipe, then you’ve come to the right place. This dish is delicious, and good for you too! 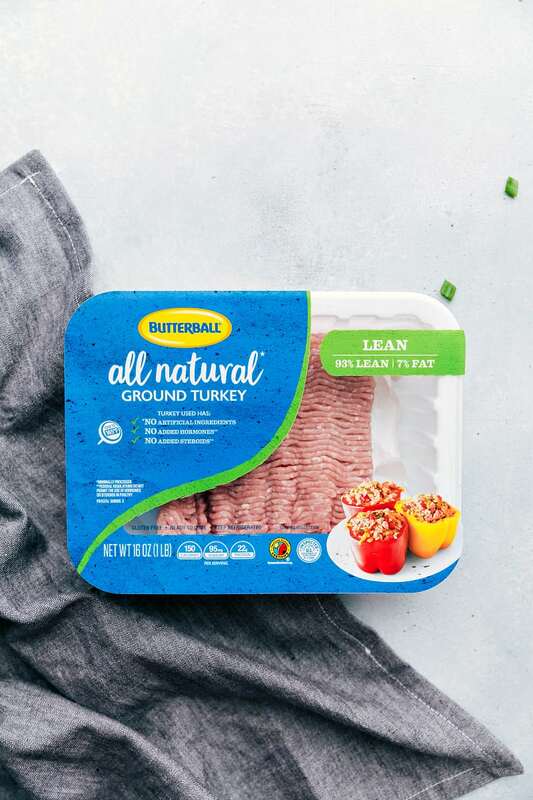 Today I’m using Butterball’s All Natural Ground Turkey along with a variety of veggies to bring you another dinner your turketarian kids will love. And trust me, if you’re the one making this dish you are going to love just how easy and quickly it comes together! The ground turkey makes this dish healthier than most stir frys all while adding a great flavor. 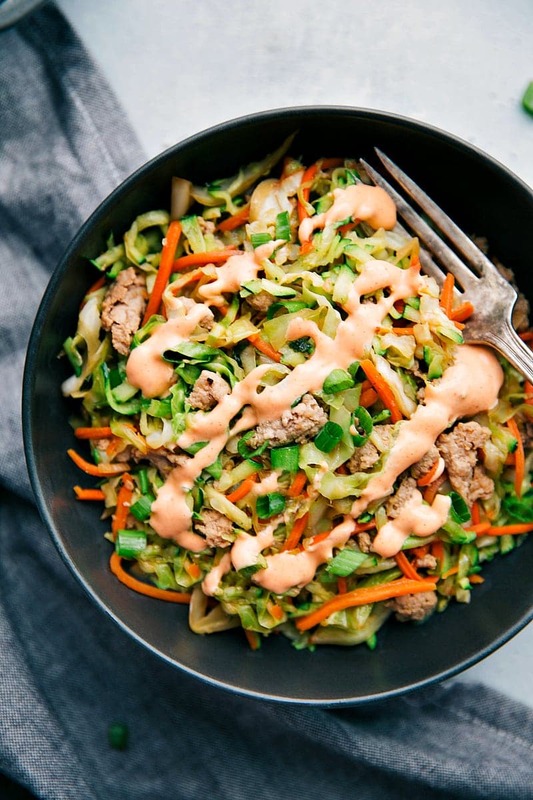 How do you make this ground turkey stir fry? Let’s start with the veggies! Shred the cabbage, grate the zucchini, slice the green onions, and mince the garlic. Once all the veggies are prepped this dish takes just minutes to assemble! Next, add a bit of oil and 3/4ths of a pound of ground turkey into a large skillet. Use a full pound if you prefer a bit more meat, otherwise you can use the leftover ground turkey in a smaller portion of this taco salad or these zucchini boats! The great thing about ground turkey recipes is browning the meat produces a lot less fat! The ground turkey cooks through in about 5-7 minutes and while it is cooking, you can prepare the easy stir fry sauce. It’s only 4 ingredients: soy sauce, sesame oil, sriracha, and brown sugar. Easy! Now it’s time to add the veggies to the meat. Start with the cabbage and carrots. Once those cook down a bit, add the zucchini, green onions, and sauce. 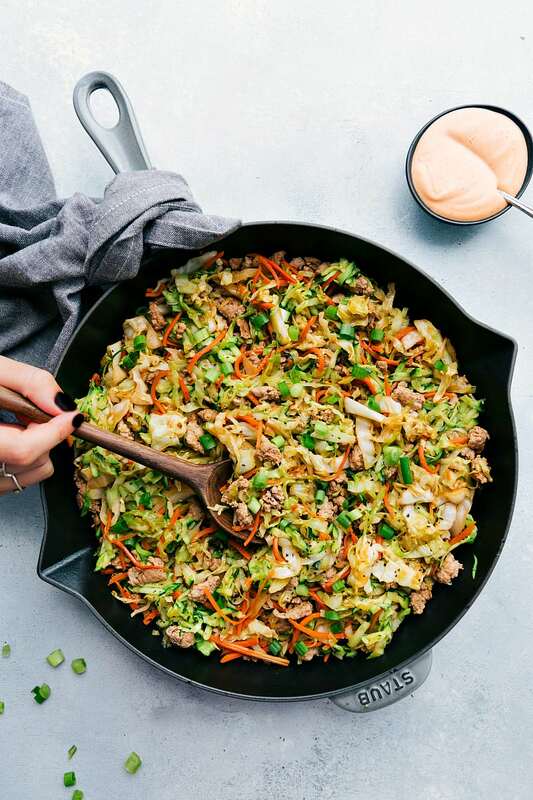 Is this ground turkey stir fry keto friendly? Yes it is! It’s also low carb and low calorie! 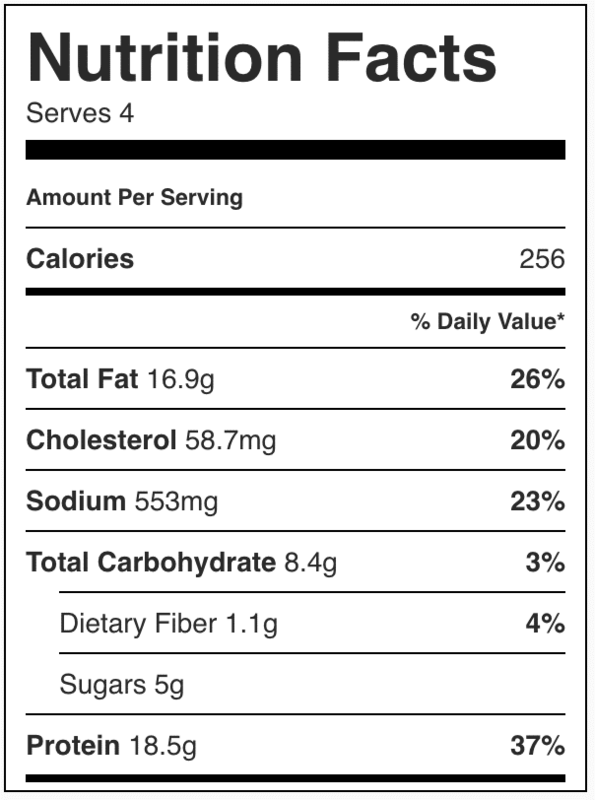 Make sure to check out the nutrition label below the recipe for more information. 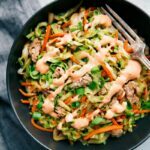 This flavor-packed ground turkey recipe is packed with good-for-you veggies and an amazing stir fry sauce! Prepare the veggies. Cut the cabbage in half, remove the core, and then finely shred one half of the cabbage. Using a cheese grater, grate the zucchini. Thinly slice 3-4 green onions. Peel the ginger and then finely shred using the small side of your grater or a zester. Mince the garlic. Heat a large skillet over medium heat. Once hot add the vegetable oil, ground turkey, garlic, ginger, and a pinch of salt and pepper. Cook until the ground turkey is cooked through, about 5-7 minutes breaking it up as you cook. While the ground turkey is cooking, prepare the sauce by stirring together the soy sauce, sesame oil, sriracha, and brown sugar. Set aside. Add the cabbage and carrots to the skillet with the ground turkey and continue to stir and cook until the cabbage is wilted. Add in the zucchini, green onions (add to preference), and the sauce. Stir for another 1-2 minutes and then remove from heat. Garnish dish with additional sliced green onions as desired. If desired serve with sriracha mayo. To make sriracha mayo: whisk together the mayo, sriracha, and lime juice until smooth. Made this last night with red cabbage vs. green. Also threw in a green pepper. Used a package of ground turkey that was 1.3 pounds. It wasn’t too much meat. Flavor was outstanding! Will definitely make this again. Thanks for the great recipe! Yay! So glad to hear this was a hit 🙂 Love your changes! Just made this for dinner and my husband and I loved it! Used 1 lb of ground turkey and a bit more cabbage because the head of cabbage I got was huge, but otherwise followed the recipe. Will definitely make this again, thank you! I’m so happy you’re enjoying it! Thanks so much for coming back and sharing what you’re changing about it 🙂 Gives us all fun ideas!! I VERY rarely comment on any recipe… This is hands down one of the best. Seriously. Thanks for sharing. Definitely best with the Shiacha mayo and served over Jasmine rice. It will go into my permanent collection. YUM!